Please join us in helping refugee families displaced by conflict and war! In partnership with RefugeeOne, the Hyde Park Refugee Project welcomed a Syrian family on December 23rd. Thanks to the support of the Hyde Park community the resettlement process is off to an excellent start! We have learned of an exciting opportunity. Initial conversations with the family revealed that close members of their family are also refugees and are in the process of being resettled elsewhere in the United States. They will arrive in the U.S. on January 3rd. At the request of the family, the Hyde Park Refugee Project and RefugeeOne are working together in an effort to redirect these relatives to Chicago so that the family can be reunited and can support one another in their transition to self-sufficiency. In order to make this possible we want to raise funds within the next few days to cover the cost of travel to Chicago for the family of five. We estimate the cost of airfare to be about $1,500. ​We thank you for your support of this effort and would like to share a quote from Margaret Mead about the power of community. "Never doubt that a small group of thoughtful, committed citizens can change the world. Indeed, it is the only thing that ever has." Spread the word by sharing this link! The Syrian Civil War began in 2011, when the government brutally cracked down on non-violent civilian uprisings. By 2014, Syria was the number one source country of refugees worldwide. 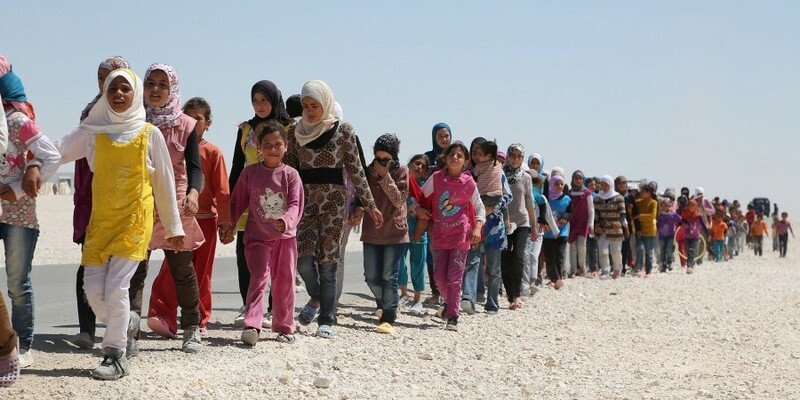 Nearly 80% of Syrian refugees are women and children.